Costs, technology and the Affordable Care Act are prompting a transition of many medical interventions into outpatient centers. This will only increase in the future. How can chaplains respond to this growing opportunity? Two experienced outpatient chaplains in West Michigan's largest health care system will offer insights about the role of chaplains in starting and maintaining outpatient chaplain programs. They will also present findings about the spiritual needs of patients and families in outpatient settings, together with resources to meet these needs. During and after this webinar, comments and questions from participants will be welcome. First, the presenters will summarize a successful proposal (including the funding component) for establishing an outpatient chaplaincy program in a radiation therapy center and an infusion center that provides chemo and several other infusions. Both will speak about the development and maintenance of this program over 11 years. In addition, they will discuss their work in a hospital-based outpatient center that offers surgeries and other procedures. Next, they will address some of the "mechanics" of approaching patients and families in outpatient settings, and how this is different from inpatient settings. They will outline the key spiritual needs that they have heard and observed among patients, families and staff in outpatient settings. How are these needs similar or different from the needs of those in inpatient settings? What do patients and staff members appreciate about chaplain services in the outpatient arena? Sr. Tracy will next present results of an extensive survey of oncology patients receiving radiation therapy or chemotherapy in outpatient centers. She will report what patients have said about what they have learned, what resources have been the most helpful, and how their spirituality has been affected by their journey with cancer and treatment. Finally, Rev. Lucas will reflect on what spiritual resources he has observed in patients and their families. He will also articulate some of the pastoral care "tools" he has found helpful in the outpatient setting. 1. Know the key ingredients to start and maintain an effective outpatient chaplaincy program as part of an interdisciplinary health care team. 2. Understand the key spiritual needs that patients and families express in outpatient settings and how chaplains can identify those needs. Rev. Jim Lucas BCC has been a staff chaplain with Spectrum Health since 1998. He graduated from Calvin Theological Seminary in Grand Rapids, MI in 1985. After working as a church pastor, he completed clinical pastoral education and was board certified with the Board of Chaplaincy Certification Inc. in 2008. Rev. Lucas works with Sr. Sue Tracy OP at the Spectrum Health Medical Center in Grand Rapids, MI. They provide chaplaincy care in two inpatient oncology units plus an outpatient radiation therapy center and infusion center. 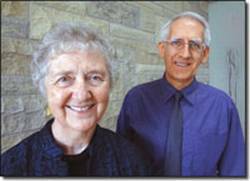 Sr. Sue Tracy graduated from Aquinas Institute of Religious Studies, Grand Rapids, in 1971. In addition to her work with Rev. Lucas as an oncology chaplain, she is the director of Holistic Health at the Dominican Center in Grand Rapids. Previously, she was the Pastoral Care director at Mercy Hospital in Toledo, OH.